St Albans – Hamburg wide-format business CCL installed a Zünd G3 to speed up its production – but soon discovered this multi-functional machine could help expand its product portfolio too. Originally founded 30 years ago as a professional photo lab, the German company has constantly kept an eye on market changes and technology advances. Now, thanks to major developments and investments in wide-format print, CCL is able to offer an extensive variety of digitally printed graphics on a variety of materials, quickly and at high quality. However, this growth in services and speed in CCL's printing department meant its finishing team was lagging behind. "While I was continually investing in the latest wide-format printing technology – our newest and, to date, largest printer has been in operation for no more than six months – I realised in early 2016 that we would have to further automate our production," says Frederik Möller, Owner and CEO of CCL. "As a means to fight competitive price pressures, we needed to considerably speed up our finishing processes including cutting, routing, creasing, and drilling – all operations we were largely still performing by hand." Möller visited Zünd's cutting-edge manufacturing facility in Altstätten, Switzerland to research the quality of Zünd systems – the overriding factor in his investment decision. He says: "I have always been impressed with Swiss craftsmanship and quality of construction." 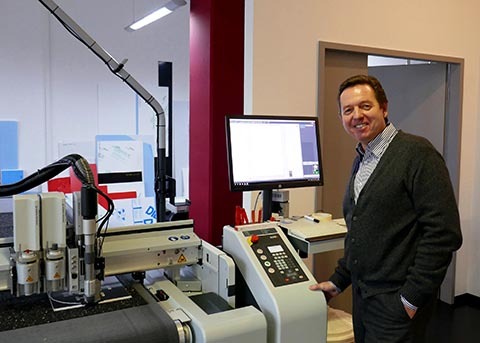 The installation of a Zünd G3 L-2500 cutting system at CCL's HQ in Bergfelde, Hamburg quickly followed, with full on-site training and seamless integration into the existing workflow. Designed for maximum automation, the G3 is ideal for accelerating production in a busy print room, whether it's to clear bottlenecks caused by faster printing technology or to free up users' time to prepare more jobs. In addition, all Zünd digital cutting tables have a modular construction to allow users to choose the exact configuration to meet their initial needs, and to change elements at a later date as those requirements change. Material handling systems, modules such as the award-winning Over Cutter Camera (OCC) and a wide selection of tools can all be fitted, removed or upgraded at any time, further future-proofing the systems' robust build. Tools can also be changed on the fly, as CCL discovered: cutting, creasing, engraving, drilling and routing are all handled on the Zünd G3, which has helped the business expand its services. As well as catering for demanding customers in Northern Germany, a new online business platform has extended CCL's reach across Europe. "We have been able to add to our product line highly popular items such as wall decorations, designer and display objects, standees and figures, and even shower screens and kitchen backsplashes made of acrylics," says Frederik Möller. "This is how I significantly expanded our product palette and, in the process, gained many new customers." Zünd has teams all over the world, meaning CCL can rely on local knowledge and support from brand specialists in Germany. Zünd users in the UK enjoy these same benefits, thanks to Zünd UK Ltd's HQ in St Albans. The site has an extensive showroom with the latest equipment and the full range of tools and parts. Ian Guest from Zünd UK Ltd comments: "The addition of a Zünd G3 has made a significant difference to CCL, allowing it to accelerate production and offer new services to its customers at exceptional quality and fast turnaround speeds. Many customers in the UK have discovered these benefits too, with the knowledge that the Zünd UK team in St Albans will provide full support for their business's development." For further information or to book a visit to Zünd UK's dedicated demonstration suite in St Albans. For further information on Zünd cutting systems, please email salesuk@zund.com or call 01727 833003. Frederik Möller oversees a range of applications on the Zünd G3.